This article gives you complete information about the fastest runner in the world Usain Bolt. This article also include biography and profile of Jamaican hero Usain Bolt. World records and career history of Usain bolt is also quoted in this article. Usain Bolt was born in Jamaica in the year 1986. The full name of Usain bolt is Usain St Leo Bolt. His amazing skill in running was known to the world in 2008 Olympic Games in Beijing, China where bold has achieved three gold medals in that Olympic games. Bolt also put three world records in 100m, 200m and 4x100m relay. At the age of 14 itself Bolt showed some amazing talent in running. He had won many medals in national meeets at his early carrier. Bolt got his first bronze medal in 80m hurdles. Ussain bolt was the first person for Jamaica to won a Gold medal in International Association of Athletics Federations (IAAF) World Junior Championships in 200m. Bolt also won IAAF Rising Star award for that performance. 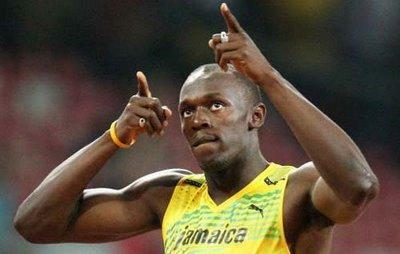 Bolt also set a record in junior 200m catagory in which he completed the track in 19.93 seconds. In 2006 he got a second place in 200m in IAAF World Cup of Athletics held in Germany. 2007 was the year of records for Usain Bolt. In that year he had broken the record of 200m set by great runner Donald Quarrie after 30 years. This record was set in World Championship held in Osaka, Japan. Usain Bolt also published a book named "Usain Bolt story" which includes all information of bolt life history written in his own words. Bolt has completed his schooling from Waldensia Primary school, Jamaica. In his school days he was the fastest runner in 200m. Usain Bolt is also interested in cricket. He was a good bowler and his favourite player is sachin Tendulkar and Waqar Younis and his favourite team is Pakistan.